Details Remains of an impressive hillfort. At 563m above sea level this is the second highest in Scotland after Griam Beg in Sutherland. Two defensive episodes have been identified. The larger, and possibly earlier, lower enclosure covers a massive 21 hectares with an outwork, a stony wall with a core of boulders, running round the break of slope on all but the steeper SE side. At least 234 platform sites within this enclosure, as well as substantial tracks. The platforms are most numerous on NE and NW sides with a few larger ones on the more southerly slopes. Some of these may be quarries, at least near the upper fort. Three glass beads, 3 Roman sherds and a bronze terret were found near this lower enclosure. 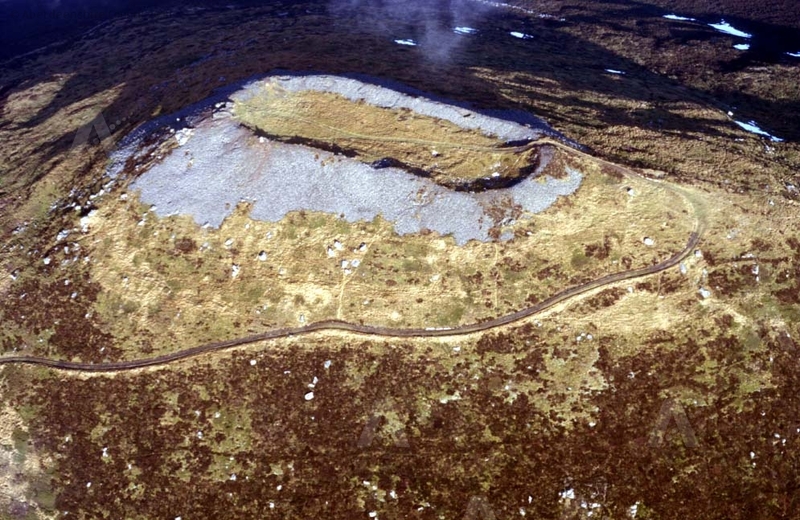 The upper fort consists of a massive stone wall, 6-8m wide and up to 3.5m high, that has been vitrified extremely heavily in places, enclosing a rectangular area. A large cistern in the interior is circa 2.2m deep. 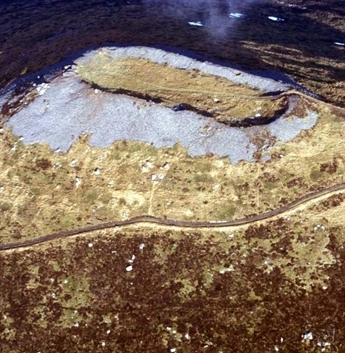 In 1997, within the upper fort, traces of a previously unrecorded enclosure formed by two concentric banks with a ditch were noted. The banks are circa 2m wide by 0.5m high with ditch circa 2m wide. The bank to the east appears to run under the vitrified fort wall. Also two possible hut circles lie within the northern part of the later upper fort, circa 8m and 5m in diameter respectively. In 1886 MacDonald excavated a section of the upper fort's wall but did not find anything. Aerial laser scanning of the fort was carried out in 2015. An evaluative excavation in the interior was carried out by University of Aberdeen (G Noble) in August 2018. This clarified the structural elements of the interior banks, and the inner vitrified wall and contributed to understanding of how the wall had collapsed and been subject to antiquarian intervention and stone robbing over time. No definite structures or material evidence was uncovered in the interior area explored by the trench. Samples Vitrified rock from main enclosure.